Bara-duree of Kaiser Bagh [Lucknow]. bl.uk > Online Gallery Home	> Online exhibitions	> Asia, Pacific and Africa Collections	> Bara-duree of Kaiser Bagh [Lucknow]. 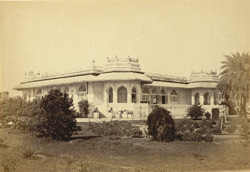 This photograph of Kaisarbagh Palace from 'The Lucknow Album: containing a series of fifty photographic views of Lucknow,' was taken by Darogha Abbas Ali c.1874. Kaisarbagh Palace built in 1848-1850 was founded by Nawab Wajid Ali Shah (r.1847-1856). Late 18th and 19th century Lucknow architecture was notably influenced by European designs however in this case the effect is "confused and decadent displaying an incoherent jumble of hybrid Indo-European facades grouped around an open space with a central pavilion."